By this point it should be fairly apparent to anyone who has seen my blog that I am pretty much a Burda fangirl. 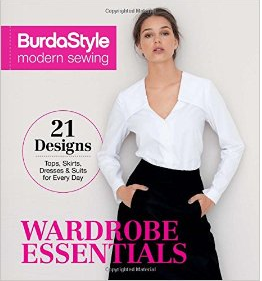 So when I heard about the release of the latest book in the BurdaStyle collection, BurdaStyle Modern Sewing: Wardrobe Essentials, I was rather excited and pre-ordered it right away. This was, unfortunately, before there were any preview images of the book (not even a cover image). Once the preview images were released it became rather apparent that this book would not contain any new patterns, and is instead a rehashing of patterns that have been released in the BurdaStyle magazines (mainly in the international versions, though some were used in the US versions as well I believe). 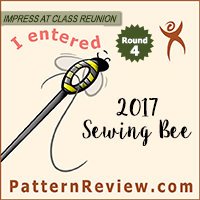 Having had a chance to read through the book I have to say that my list of praises far outdistances my list of complaints, though my complaints may have more weight than my praises, at least for other long-time Burda sewists. This book is definitely aimed for someone who is not a beginner to sewing, but may be new to using Burda patterns. The introduction includes information about measurements, sizes, difficulty ratings, pattern symbols, instructions for common techniques (ease pleats, front fly zip insertion, interfacing, invisible zippers, marking patterns, seam finishing, understitching, and a list of common notions and tools). There is also information about grading sizes and notes about seam allowances (which ARE included for many of the patterns included with the book). The end of the book contains a glossary and a few pages of instruction about how to use a serger. The rest of the book gives detailed sewing instructions for the patterns that are included. The most common complaints about Burda sewing patterns are (1) poorly translated/confusing instructions, (2) the difficulty of tracing, and (3) the lack of seam allowances. While I would argue that the last can be more of a benefit than a detriment, I have to concede that this book address all three of these issues. The instructions, while not much different from the original in terms of construction order, are much more readable than than what typically come in the magazine. Additionally, many of the more complex steps have accompanying illustrations to help clarify the directions. The pattern sheets are also much improved over the international versions – they are more reminiscent of the previous pattern sheets where everything was much more spaced out and easier to read (circa 2006). You will still have to trace, but it won’t be quite as migraine-inducing as the regular sheets. 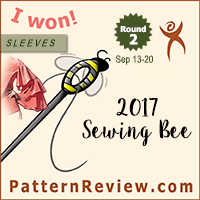 As for the seam allowances – the introduction indicates that most patterns are given a 5/8″ seam allowance and a 1.5″ hem allowance, though some are given more or less as indicated on the pattern. As with the magazines, you may have to draft your own pieces when making something simple, such as the rectangles needed for welt pockets. A few other positive aspects of the book – it has a nice spiral binding, which makes it very easy to leave open to the instruction as you are working on construction, the text is quite legible, and the storage pocket in the back makes it very easy to store the pattern sheets as well. Concluding thoughts: If you are an established Burda user who no longer has the time to raise a brow at the often perplexing instructions and ponder why anyone would complain about the pattern tracing, this probably isn’ the book for you. You most likely already have all of these patterns in your stash, and the additions of seam allowances and extra instructions will probably feel like unnecessary fluff and hand-holding. If you are somewhat newer to sewing with Burda, then this book might be useful – especially the section explaining what the various pattern symbols mean, as they are different from what the Big4 use. If you have been scared off of Burda because of the complaints listed above, yet still long for that swanky German styling – good news! This book is totally going to be your jam. I highly recommend it as a way to ease into using Burda patterns – it is a great way to get used to the Burda system without having to remember details like adding seam allowances and trying to decipher the magazine instructions. Another comprehensive review – your detail is impressive!